Hearthstone's villains have united for Rise of Shadows and today, Shacknews continues breaking down each card one-by-one leading up to its April release. Earlier this month, Blizzard revealed what's next for its long-running digital collectible card game Hearthstone. The new Standard will officially begin with the arrival of 2019's first expansion, Rise of Shadows. The villains have all united to usher in the Year of the Dragon. And that means a whole new set of cards to take Hearthstone into a brave new world. Analysis: Oh, you've gotta be kidding me with this card. 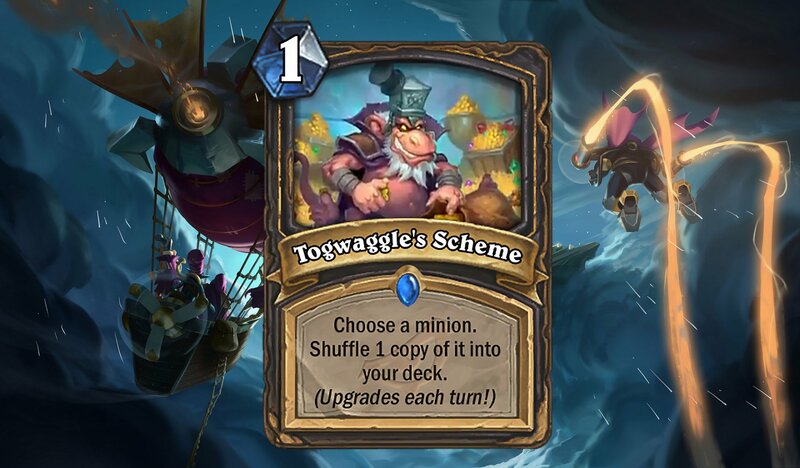 Togwaggle's Scheme almost ensures that the Rogue is fatigue-proof. If it shows up in the player's opening hand and it goes into the late, it has the potential to shuffle dozens of minions into the Rogue player's deck. This puts Lab Recruiter to absolute shame. This can fit in a variety of Rogue decks. It'll fit in a spider deck, it'll fit in a Pogo Hopper deck, and it can even fit in a Pirate deck. Wild players will easily be able to fit this into a Quest Rogue deck, too. For one cost, this spell is going to show up a lot in the meta going forward and I wouldn't be surprised to see it become a potential nerf candidate within weeks. Analysis: Hagatha's second form has the potential to be really powerful for Shaman players. If you can withstand a Turn 7 where you play a relatively weak 5/5, you'll add a 5-Cost 5/5 Horror with the Battlecry of dealing out two Shaman spells. But which Shaman spells? Keep in mind that Healing Rain is set to rotate out to Wild. That leaves Lightning Storm for board clear or Eureka to help potentially call forth a second big body. Rain of Toads could also be useful in filling up the board with Taunts to go along with that 5/5 body. 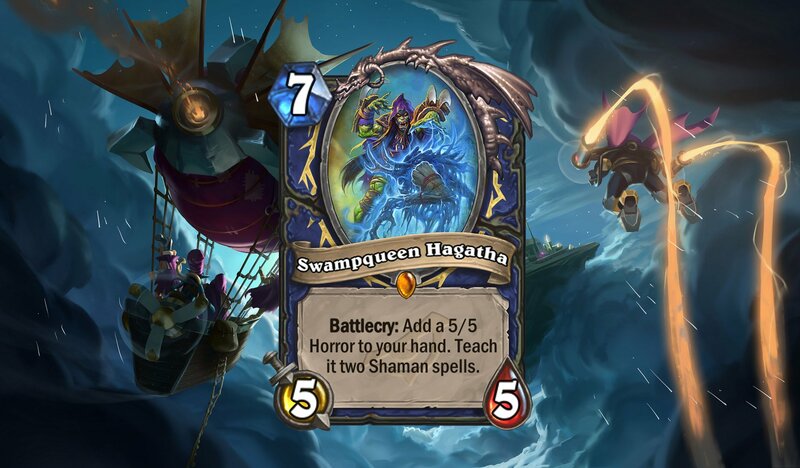 The jury's tentatively out on the new Hagatha until we see what the other Shaman spells for this set look like. But right now, it's looking pretty solid, especially for Wild Shamans. 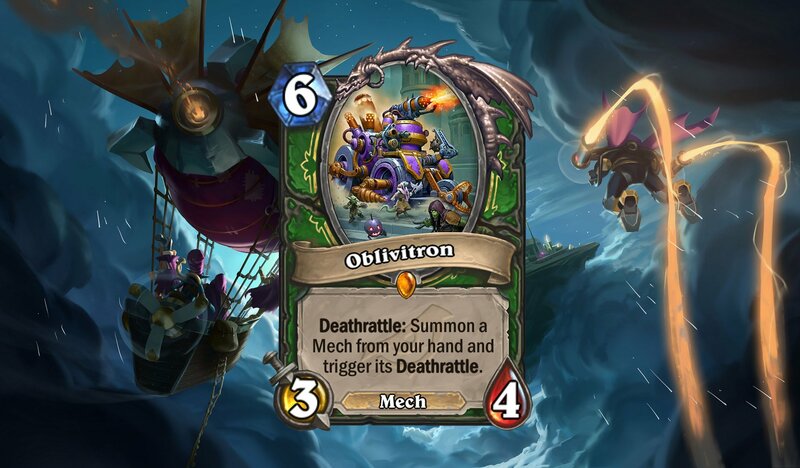 Analysis: Oblivitron could work well in a Hunter Mech deck, but it would ultimately depend on which Mechs we're talking about. The most obvious synergy here would be with Spider Bomb, but there are few others this could work with. Weaponized Pinata would work nicely with Oblivitron, but few other Mechs currently in Standard stand to really benefit from this effect. Build your deck carefully, otherwise this effect could be a dud. Analysis: Lazul's Scheme will work beautifully with Cabal Shadow Priest to help take control of a pesky opposing minion. 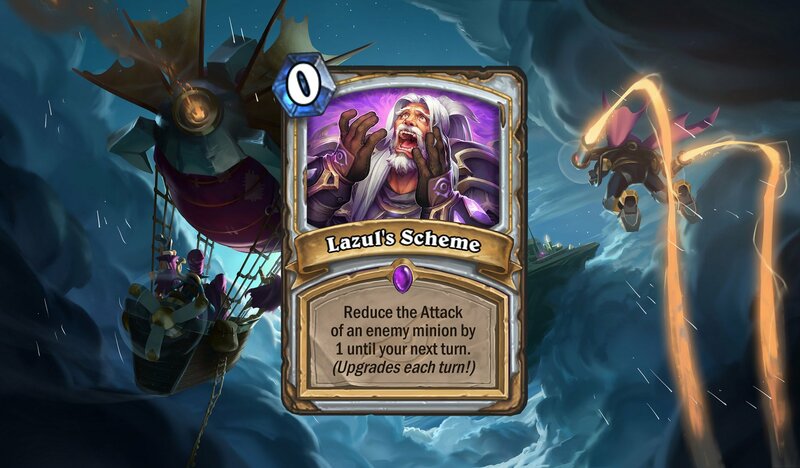 There's also room for shenanigans here, since it's possible to cast Lazul's Scheme on a minion, reduce its Attack to zero, and then wipe it out with Topsy Turvy all for the low cost of zero! And that's a very handy combo for decks running Surrender to Madness, which don't have too much mana to work with in the early game. Source: Hearthside Chat - Rise of Shadows: Extraordinarily E.V.I.L. 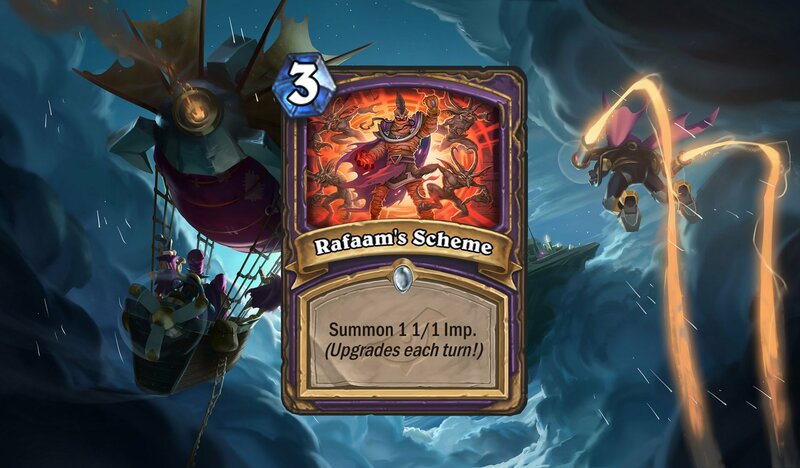 Analysis: Rafaam may be an evil genius, but his Scheme doesn't look too good on paper. What's somebody going to do with a bunch of 1/1 Imps? Well, there are a bunch of spells that can interact with them in various ways. Grim Rally removes one Imp and buffs the rest of them into 2/2 Imps. Dark Possession removes one from the board and finds a better Demon. Certain minions can work with this, too. Spirit of the Bat can make great use of these paper-thin Imps and use their deaths to power up whatever else is in hand. This shouldn't be anyone's first choice, but Rafaam's Scheme isn't entirely useless. It just doesn't look to be high tier. Analysis: This is a fantastic minion for the Warrior player, both in constructed and Arena. With 4/5 stats, it goes along the upper tier of 4-Cost minions. It becomes much more effective in the late game, with its ability to remove a majority of late game minions. Better yet, it's going to be an A+ pull from the Dr. Boom, Mad Genius Discover effect. Imagine pulling this out and getting a chance to potentially remove something powerful from the opposing side while also putting a 4/5 on the board. 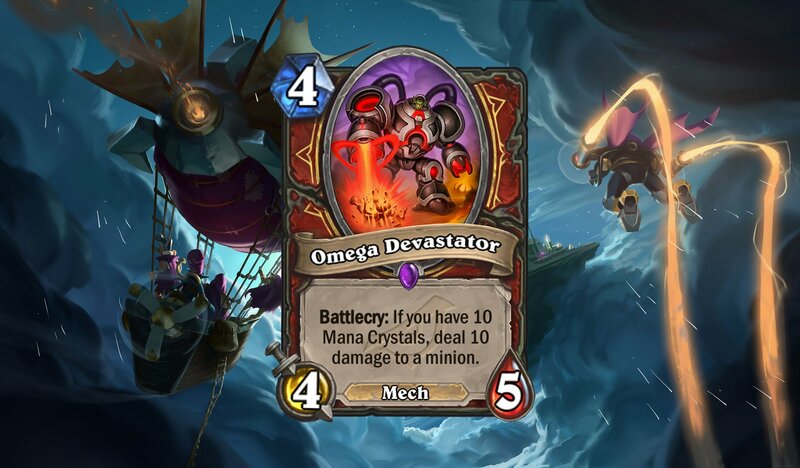 Yes, Omega Devastator will prove to be one of the better Warrior minions to come out of this expansion. Analysis: This is an interesting way to add a Lackey to your hand. Think of this as a cheaper Slam, with arguably greater value. It's a low cost combo to play this card alongside Execute or Devastate. This should definitely find a home in more than a few Control Warrior decks. Battlecry: Discover a copy of a card in your opponent's hand. Analysis: So maybe Chameleos hasn't caught on the way some people expected when it was first revealed. But Madame Lazul stands to be a better "peek at your opponent's hand" card. That's because her Discover effect will give you a peek at three of your opponent's card, while letting you keep a copy of one of them. That makes it easy to turn the tables on them with their own shenanigans or makes it easier to prepare for the wombo combo that's potentially headed your way. Madame Lazul's 3/2 stats won't fare well, but it'll be worth throwing out there to potentially learn the opponent's win condition. It's a high-value recon play and one that could come in handy in constructed play. Shacknews will continue to monitor cards and analyze them in the lead-up to the next big Hearthstone expansion. Come back next week, as we continue with the community-revealed cards. Hearthstone: Rise of Shadows is set to release on April 9.